Dumping is the illegal or improper disposal of any item including household waste, hazardous waste, and municipal waste like construction and demolition debris. In Oakland, dumping is a problem of serious scope with public health ramifications and environmental toxicology risks. It restricts properly values, contributes to a state of blight, and is also expensive for the city. West Oakland, a low-income urban area, struggles with public sanitation and environmental justice challenges including the harmful effects of waste dumping and toxins. Although the City of Oakland has a progressive Waste Management program and Zero Waste policy, which includes waste diversion and reduction goals, there are significant implementation issues that impede access to services for all community members. This report explores alternatives to dumping in West Oakland that are accessible and equitable for low income people who may not have vehicles and may lack or money, time, or resources to facilitate hauling by a third party. Low income people also move more often, experience higher rates of housing instability, and are more likely to be renters rather than homeowners as compared to middle and high income people. I present innovative solutions to waste management challenges are locally specific, community driven, and rooted in struggles for environmental and social justice. The term “freecycling” describes the communal use of free piles, which represent locations of exchange and donation where surplus items are placed in the public spaces, typically sidewalks, so that others can take and make use of them. However if free piles are not claimed or cleaned up they become public sanitation hazards that do not always differ aesthetically from dump sites. How, when, and where to discard of an unwanted item represents one of many everyday decisions faced by members of the community. An analysis of environmental conditions in West Oakland must include an understanding of its human communities. The health effects of toxins in the environment reveal the interlocking nature of oppressions. Social marginalization and environmental marginalization are intrinsically linked. According to a recent study on air toxins, West Oakland, a low-income area consisting of several historically black neighborhoods, experiences a rate of childhood hospitalization for asthma that is 150% higher than Alameda County’s average. It is also considered to be a food desert by community members and policy makers alike. This coincides with other effects of environmental racism, discriminatory policies and practices whereby communities of color and sources of environmental contamination were deliberately situated on the same land. For many centuries, dumping waste outside of the home was the most common waste disposal practice. As populations began to rise and people began to consume more disposable goods, this became increasingly problematic. The Solid Waste Disposal Act of 1965 asserted that dumping was a serious concern and established the federal government’s role in solid waste management, which was strengthened in the Resource Recovery Act of 1970. Although the federal government is involved, especially in the regulation and disposal of hazardous waste, responsibility for municipal waste is given to local government. Given that the average American creates about 1600 pounds of trash a year, every municipality must have a plan in place to manage its waste. Oakland, with 390,724 residents as of 2010, faces significant waste-related challenges. The city contracts with two companies: Waste Management, which provides services for landfill garbage and composting of green-waste, and California Recycles, which oversees Recycling Bin distribution. Trash collection starts at $30 per month per residence and includes all three bins and servicing as well as one bulky waste pickup per year. Owners are charged $25 per cubic foot for additional pickup. Waste is transported to the Davis Street Recycling and Resource Center in San Leandro where it is sorted and then transferred to a processing facility. While a number of preventative measures are also used, the main way that Oakland policy deters dumping is through criminalization. Section 8.11 of the Oakland Municipal Code was recently updated on September 13, 2013. It classifies illegal dumping as a public nuisance and makes large commercial quantities of illegal dumping a misdemeanor while smaller quantities are an infraction. In addition the city assesses a penalty of up to $1000 per item per day for large items that are dumped including mattresses and couches. In some cases community service is allowed in lieu of these monetary penalties. All people who generate waste have cradle to grave responsibility for that waste, but property owners are made liable for materials renters illegally dump near their rental units. They are also required to disclose forwarding information for renters who leave and illegally dump belongings. In addition, all people of Oakland are encouraged to report on each other if we believe we have witnessed dumping. The City of Oakland website encourages us to utilize both a Public Works Call Center and the OPD non-emergency line to make these reports. Recently, a number of mobile phone applications including SeeClickFix are also used to facilitate the reporting and mapping of dump sites. Use economic stimulus to strengthen local recycling enterprise. Although the city could in theory employ all of these options, for practical purposes it would be useful to identify the most promising, and to compare them to a continuation of the status quo. Therefore, each policy option is evaluated according to its efficiency, effectiveness, and equity (social justice), and with the following goals of the Coalition for West Oakland Revitalization (1994) in mind. Criminalization as a policy is only slightly effective. Although it acts as a deterrent, it is difficult to enforce because it is hard to prove that a specific individual is guilty of illegal dumping even in instances where their license plate has been captured by surveillance devices. Very little funding is advocated to proper enforcement. The city only has a few dedicated staff people who investigate only the largest dump sites sifting through items looking for “evidence”, usually documents with personal information about the dumper. Criminalization does not solve the greater problem for the community or for the environment and it does not address the social inequities that make some people more likely to dump, including gentrification-related displacement. (According to some estimates, rent in parts of Oakland went up by more than 30% in 2012.Moving is expensive and displaced people, who are losing their housing, face unique waste management challenges that are tied to their economic vulnerability. For example they may need to conserve their money in order to secure new housing and may be literally unable to afford to pay a hauling company. However, even when not threatened by housing instability, a person who does not have regular access to automobile transportation faces significant barriers in the disposal of their unwanted goods. It is not as easy as simply taking unwanted goods to the nearest second hand store for drop off. This change to the existing policy would allow renters to directly negotiate with Waste Management. Property owners are currently responsible for the waste that their renters produce. Only they can request services and changes including the annual bulky item pickup. Renters already manage their own accounts with PG&E and EBMUD, why not Waste Management too? Making renters responsible for their own waste and allowing them to negotiate with providers could help to make renters more accountable. It would also ensure that they are able to access the services for which they pay and to which they are legally entitled. While the policy as it stands is ineffective, it is also possible that changing the responsible party for solid waste in a rented property could backfire and provide more opportunity for property owner negligence or for legal dispute over who is responsible for dumping. However, the change could empower renters to be more involved in their waste management decisions and could increase their access to services. Overall I do not think that there would be significant costs involved. Any uptick in renters requesting services may be cost effective in the long run if it results in decreased costs for dump site cleanups. This change would provide renters more control over how their waste is managed, which is fair since they are the ones who generate it. Equity could be approached even if the policy is not completely changed but merely modified to ensure that renters with negligent property owners are able to access a greater range of services. However, full equity and effectiveness are still not possible because this alternative does not address the problem of homeless people, marginally housed people, evicted people, and people without waste management services who dump. It also does not impact dumping by property owners and contractors. Redistribution of surplus goods is a form of waste diversion. “Free stores”, community piles, and swap meets all have redistributive effects that also divert waste. Oakland could institute a series of neighborhood cleanup and swap days. Under this program, a few days each year residents can create free piles in front of their homes without fear of dumping charges. After community members have had a chance to scavenge, Waste Management could facilitate hauling of the remaining goods. The City of Citrus Heights facilitates three neighborhood cleanup days per year. Although it is a smaller city than Oakland, its guidelines could be helpful in tailoring a program to meet Oakland’s needs. To maximize effectiveness, collection should occur several times a year per neighborhood. Although this program could be expensive to implement, the fees could be bundled into trash collection as they are in many other cities. The fee for this could be bundled into the price of garbage pickup. If residents do not find a fee increase agreeable, it is possible that the free bulky item pickup could be replaced with the neighborhood cleanup day removing scheduling responsibilities from property owners. Waste Management currently sponsors four bulky item drop-off days per year where people can take unwanted goods to the Davis Street Recycling Center and avoid disposal fees. However, there are still transport costs, which are prohibitive for low-income people. 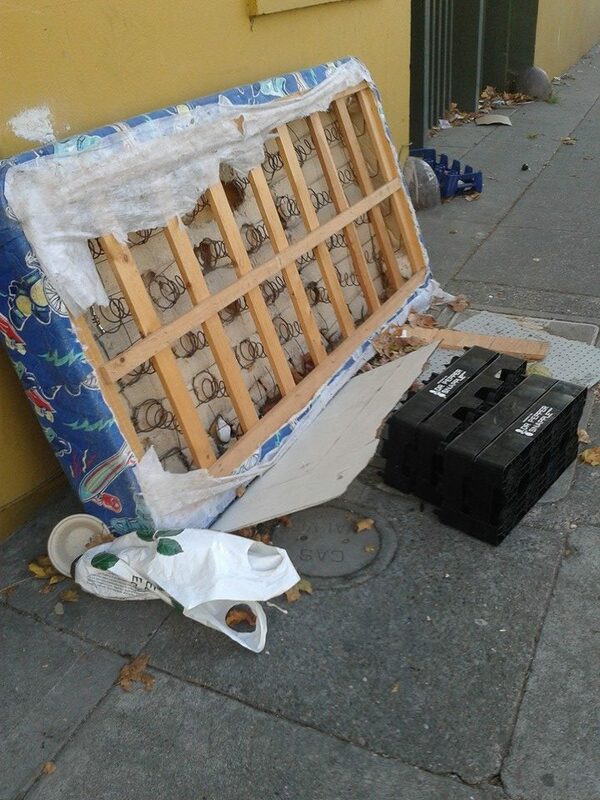 Instituting regular neighborhood cleanup days could prevent much of the dumping of mattresses and large furniture items that are costly to haul. It may be less effective at preventing the dumping of municipal waste, bedbug infested furniture, and landlord or contractor dumping. Despite these limitations, this is the most equitable of my proposed solutions because every neighborhood of the city gets served at least twice a year ensuring equal access to services and also because homeless and marginally housed people can contribute to and scavenge from cleanup piles. Citrus Heights allows residents to put out materials for clean-up up to two days prior to collection. Allowing people the chance to pick through piles and scavenge goods first reduces costs for the city and ensures that people are also able to access free goods. It preserves the freecycle tradition and the concept of the commons as a site of abundance and opportunity while also including a plan for pickup. The city currently employs a number of public education toolkits aimed at dumping prevention. Unfortunately these do not get much further than “no dumping.” Oakland could alter this strategy by instead teaching the public about waste reduction and diversion. These goals rely on multiple strategies to intervene in the waste stream so that fewer items end up dumped and in landfills. Practices such as “refuse, reduce, reuse, and recycle” should all be encouraged. Waste sorting, the separation of waste based on disposal or recycle method, diverts waste from local landfills and streets, but many people do not properly understand how to sort waste and why doing so is important. This strategy is important because it spreads much needed information, but not all members of the public will be receptive to the campaign. It is very hard to get people to change their consumption habits.A certain proportion of people will not be reached by the message, will not care, or will not have the means to comply. Additionally, certain forms of advertising will be expensive. There will be costs involved with designing and distributing materials even if adequate free prototypes can be found. Educational materials must be distributed in a number of mediums and languages in order to reach the maximum number of people. For example, written materials will not be as effective for those with limited literacy. It may be more effective, efficient, and equitable to train leaders and grassroots organizers to talk to their communities about this so that the message can be spread in ways that are tailored to each individual community according to their needs and values. Policy makers can use economic tools to support sustainable recycling businesses such as scrap metal recyclers, secondhand stores, re-manufacturing companies and various projects involved with the “upcycling” of unwanted goods. One way to do this is by strengthening the existing Oakland Berkeley Recycling Market Development Zone. In Oakland CA: Towards a Sustainable City, Mose Durst describes the RMDZ writing, “Its focus is to assist companies in the recycling of waste by developing inventive ‘closed-loop’ procedures whereby the waste material from one process is turned into a marketable product or products.” Changing the value of used objects would change people’s attitudes curbing their desires to dump or improperly dispose of unwanted things. These things would instead be exchanged in a marketplace and recycling entrepreneurship and scavenger recycling would be incentivized. In the long run, according to economic theory, this would be effective. By raising costs for second-hand resources, people will have more incentives to save and sell these goods rather than dump them. It is a policy that encourages materials reuse of both municipal waste and construction and demolition debris. The Coalition for West Oakland Revitalization writes that “RMDZs are set up similarly to the federally designated Enterprise Zones and provide State-sponsored support to recycling based businesses in the form of low-interest loans, help with siting and or permitting a plant, and access to feedstock for manufacturing, to name a few services.”Recycling businesses also create local “green collar” jobs and provide tax revenue while reducing pollution and diverting usable materials from the waste stream. This analysis suggests that recycling facilities benefit communities. Despite these benefits, there are also drawbacks including many possible cost barriers. This policy would be inefficient and ineffective in the short run. It would probably take a long time to reduce the quantity of items being dumped and it will not be effective for some types of waste. Additionally, environmental and health impacts of recycling facilities could exaggerate problems with toxins that West Oakland already struggles with. For recycling to be an equitable policy alternative it must be local, clean, safe, quiet, and aesthetically pleasing recycling of what goods cannot first be refused, reduced, or reused. All of the suggested alternatives would help to correct the dumping problem, and many are already used. But the implementation and accessibility of all should be improved for any of these alternatives to be an effective deterrent to dumping. Each policy, including the status quo policy, has merit, but if policy makers were to choose just one, this report finds neighborhood cleanup days to be the most effective and equitable for low- income people and for those without cars. Oakland policymakers could look at the successful cleanup programs in Citrus Heights and Irving, two California cities that have successfully solved similar dumping problems. The city of Irving published a document after their own successful clean-up efforts entitled “How to Organize a Neighborhood Cleanup Day in Twelve Easy Steps,” which could be of great use to the city of Oakland. In addition, this report recommends that Oakland reconfigure its current educational campaigns focusing on training grassroots leaders to organize in their communities around dumping and distribute educational materials through public institutions like local libraries, schools, churches, and community centers. There are many things that concerned individuals and communities can do to make a difference that do not require policy change. Strategies include: learning to do without, learning to repair and redesign old clothing, choosing to purchase items with less packaging, organizing yard sales or swap meets, and giving away unneeded goods using platforms like Freecycle.com. While reducing our personal trash footprint, we can also educate others about how to live less impactful lives through the refuse, reduce, reuse, recycle matrix. Individuals can make the choice to downshift which Rathje describes as the “voluntary decision to work less, spend less, and live more simply.” We must also take personal initiative for cleaning up MOOP near our residences. MOOP stands for Matter Out of Place. It is any good, ranging from dumped furniture to litter and micro-trash that is not where it should be. I encourage individuals to exchange surplus clothing with others in their communities and to avoid donating to organizations that irresponsibly profit from overseas recycling. When disposal of goods is necessary, neighbors can combine resources for hauling fees. This also reduces the environmental impact of hauling. Those who choose to continue the free-pile tradition can pledge to clean-up the remains of our piles after they have been picked through. Finally, community members can put pressure on our local elected officials to institute any policy option that we find preferable including those not discussed in this work. Together we can make our neighborhoods safer, cleaner, and less toxic! Elizabeth Welsh returned to Mills to work on her MPP after completing a BA in Urban Studies. She is particularly interested in Environmental Policy as it pertains to issues of waste reduction and diversion. Her professional specialties are event waste, land-use, and permitting, but as a policy student she is expanding her scope to encompass household and municipal waste. She is committed to bringing members of the public together to connect across common ground and to participate in the decision making processes that shape our communities. Shiva, V. (2005). Earth democracy: justice, sustainability, and peace. Cambridge, Mass. : South End Press. West Oakland visions & strategies: phase one report — a community plan. (1994). Oakland, CA: Coalition for West Oakland Revitalization, 50-51. Fisher, J. B., Kelly, M., & Romm, J. (2006). Scales Of Environmental Justice: Combining GIS And Spatial Analysis For Air Toxics In West Oakland, California. Health & Place, 12(4), 701-714. Wagner, T. (2004). Hazardous Waste: Evolution Of A National Environmental Problem. Journal of Policy History, 16(04), 306. “Cradle to grave” is the terminology used in the municipal code. It means that you have responsibility for your waste from the time it is generated until it reaches its final resting place, the municipal landfill, recycling, or green waste facility. Bardach, E. (2009). Appendix B: Things Governments Do. Practical Guide for Policy Analysis (3rd ed., p. 0). Washington DC: CQ Press. O’Hare, M. (1989). A Typology Of Governmental Action. Journal of Policy Analysis and Management, 8(4), 670. West Oakland visions & strategies: phase one report — a community plan. (1994). Oakland, CA: Coalition for West Oakland Revitalization. Rathje, W. L., & Murphy, C. (1992). Rubbish! : the archaeology of garbage. New York, NY: HarperCollins Publishers. Durst, M. (2006). Oakland, California: toward a sustainable city. Bloomington, Ind. : AuthorHouse. 70. Zimring, C. A. (2005). Cash for your trash scrap recycling in America. New Brunswick, N.J.: Rutgers University Press. Terry, B. (2012). Plastic-Free How I Kicked the Plastic Habit and How You Can Too.. New York: Constable & Robinson. Milner, G. (2013, August 12). Don’t Be Clothes Minded: Understanding the impact of donated clothes; http://www.whydev.org. whydev.org.